Since debuting in 2008, AMC’s Breaking Bad has taken one central idea—cancer-stricken high-school chemistry teacher decides to start cooking meth to provide for his family after he’s gone—and examined it from multiple angles while taking its central character deeper into his own depravity. It’s a relentlessly bleak, hilariously funny descent into one American man’s heart of darkness, plotted with the kick of a first-rate thriller. And that’s to say nothing of the way it uses the vistas of its New Mexico filming locations, making it one of the best-looking shows on TV. Starting the series would ideally mean spending a whole week getting caught up on the four seasons that have already aired. But you don’t have a whole week! The show’s fifth season begins Sunday, and even if you stop sleeping, you’re never going to get through all four seasons in time. We’re here to help! We’ve taken the series and boiled it down to 10 episodes that show why this series is so acclaimed and so addictive, episodes that will more or less get you caught up on the series’ plot arc (provided you’re willing to turn to Wikipedia to fill in a few gaps), while giving you a good sense of its main character, Walter White (played by Bryan Cranston). To appreciate the full greatness of the series, including its rich supporting cast and precise plotting, requires watching the whole thing, of course, but these 10 should be enough to get you conversant in time for Sunday night’s première. Many pilots are skippable, more of a mission statement than an essential episode of the show. And to be sure, if this were a list of Breaking Bad’s 10 best episodes, the pilot would be nowhere near it. But it’s necessary to watch the pilot to get a sense of where Walter White started out. Only by seeing his origin as a meek man crushed by life and standing on the brink of death can his full transformation be appreciated, even in an abbreviated run through the series. Plus, the pilot offers up the show’s unique blend of comedy, drama, and thrills in miniature. Series creator Vince Gilligan wrote the first four episodes of Breaking Bad, and they function as a mini-arc that shows how the show will operate going forward. Walter makes a decision. The decision has repercussions. The repercussions force him to contemplate an even more awful decision. That’s the case here, as Walter locks up a drug dealer named Krazy 8, a young man who knows too much and must die, though Walter is unwilling to take a human life. Gilligan is great at not letting Walter off the hook for the bad choices he makes, and in this episode, the series first made its case for all-time status. As the first season concludes, Walter and his protégé, former student Jesse Pinkman (Aaron Paul), begin doing business with the larger Albuquerque drug scene, a decision that ultimately leads to horrific consequences. (There’s that arc again.) But much of the fun of the show comes from seeing Walter weasel his way out of a situation where a more experienced criminal seems to have him dead to rights, then explain his actions to his family and society at large. That’s the case here, as Walter and Jesse are forced to improvise a solution to a conundrum that would otherwise see at least one of them criminally prosecuted, with Walter forced to do his thinking while wearing a hospital gown. As the show’s second season progressed, it began introducing memorable bit players who would grow into series regulars. The first was Saul Goodman, a shady lawyer dedicated to helping people in the drug trade stay out of jail, who takes on Walter and Jesse as clients. Memorably played by Bob Odenkirk, Saul represents the series beginning to pull back from its ultra-tight focus on Walter to portray more of the world in which it’s set. One of the qualities that initially kept Walter White “likable,” as TV executives usually like TV characters to be, was his unwillingness to kill unless he or his family was threatened. In spite of his criminal activities, he remained fundamentally a good family man. The cracks in that foundation began to show in season two, when Walter lost more and more of his initial rationale to become a meth cook and slowly gave in to his own darkness. The foundation shatters in “Phoenix,” an episode in which Walter sees a bad influence on Jesse and decides—through inaction—to let it slip away. The episode also begins delving into the series’ more metaphysical side, improbably bringing Walter into contact with someone whose life he will soon destroy. The first five episodes of Breaking Bad’s third, and best, season have many terrific moments—particularly those involving Walter’s marriage to Skyler (Anna Gunn)—but the series kicks into high gear with “Sunset,” an episode in which Walter’s DEA agent brother-in-law Hank (Dean Norris), a man who would never suspect Walter, unknowingly pins Walter down in a place from which he seemingly can’t escape. It also provides a great introduction for Gus Fring (Giancarlo Esposito), Walter’s terrifyingly buttoned-down new boss, and a pair of murderous cousins who confirm the series has taken a pulpier turn (a trend that continues in the first two episodes of season five). Though not an explicitly religious series, Breaking Bad seems to take place in a universe where good is rewarded and evil is punished, eventually. That’s never been more apparent than in this episode, which takes a break from Walter’s arc to consider the story of Hank, a good man trying to do good things who’s been rattled by a bloody explosion in the season prior. While the episode returns to Walter from time to time, it’s primarily about Hank and his fears of his own powerlessness, following up on important plot points from “Sunset” and concluding in one of the series’ greatest action sequences. While Breaking Bad’s relentless focus on its serialized plot means that it rarely has time to attempt more experimental episodes like its AMC cousin Mad Men, it has wandered off the path just a bit from time to time. 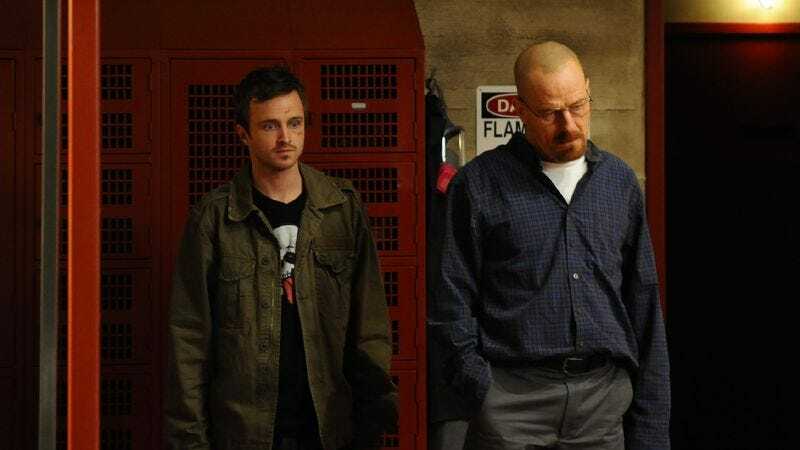 The best example is this two-person character piece between Walter and Jesse, as the two spend a long day in the Fring-built “super-lab” trying to kill a fly that could contaminate their latest batch. The tension in the episode arises almost entirely from whether or not the two will get that fly and whether or not Walter will let slip some incriminating information to Jesse. That Breaking Bad makes this so enthralling is testament to the quality of the writing and how beautifully director Rian Johnson keeps the action from feeling stagebound. Season four of the series takes the focus off Walter in the early going, instead depicting how his choices have spiraled outward, affecting nearly everyone around him. It also delves into the backstory of Gus Fring, who serves as the season’s antagonist. In the final stretch of episodes, however, Gilligan and his writers bring things squarely back to Walter in thrilling fashion, and the corner they back him into in this episode is the tightest yet, as captured by an instantly famous closing shot. Breaking Bad’s season finales are always good, but they’re also almost always beside the point, wrapping up storylines thoroughly and in such a way that the next season has to take the few loose ends and race off in entirely new directions. Still, if you’re going to watch one of the show’s finales in time for Sunday’s première, there’s no better one than last season’s, in which Walter and Gus finally have their showdown and Walter is forced to launch the most intricate scheme of the series. It’s all a little unbelievable, honestly (and watching the pilot and this episode in rapid succession should show just how pulpy the show has become), but on a character level, it feels perfect. Walter’s devolution continues; the only hope for salvation lies elsewhere now. Availability: The complete run of the series is on DVD. The first three seasons are available on Netflix streaming, and season four joins them on Sunday. Next time: It’s the series on which Vince Gilligan got his start: The X-Files.